"Seventy-one years ago, on a bright, cloudless morning, death fell from the sky and the world was changed," President Obama began, imagining the horror of Aug. 6, 1945. "A flash of light and a wall of fire destroyed the city. It demonstrated that mankind possessed the means to destroy itself." After laying a wreath at the Hiroshima Peace Memorial, Obama mourned the Japanese, Korean and U.S. victims of the world's first atomic blast in World War II. 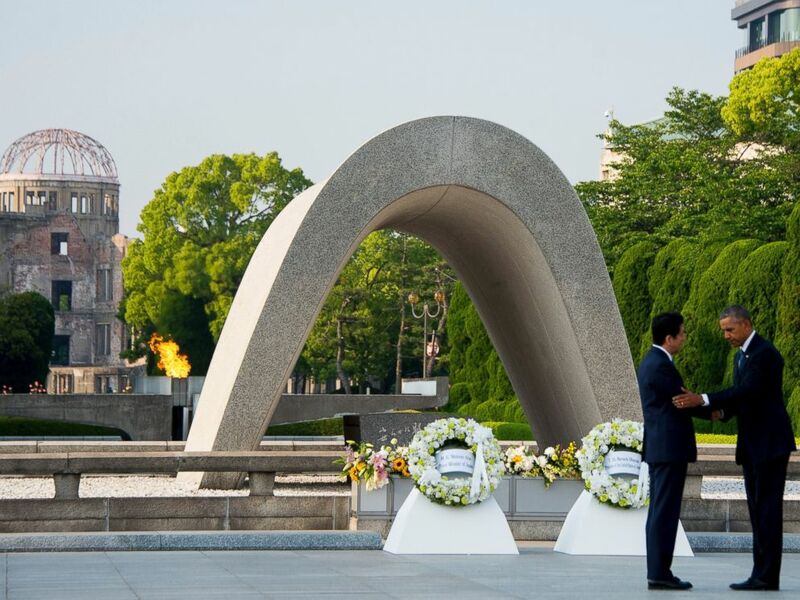 President Barack Obama and Japanese Prime Minister Shinzo Abe shake hands after laying wreaths at the Hiroshima Peace Memorial Park in Hiroshima on May 27, 2016. "Their souls speak to us, and they ask us to look inward, take stock of who we are and what we might become," he said. Invoking the image of a mushroom cloud over Hiroshima, the president cited "humanity's core contradiction” -- the capacity for "unmatched destruction" -- and called for a "moral evolution." President Barack Obama delivers remarks next to Japanese Prime Minister Shinzo Abe at Hiroshima Peace Memorial Park in Hiroshima, western, Japan, May 27, 2016. "That is why we come to this place," Obama said. "We stand here, in the middle of this city and force ourselves to imagine the moment the bomb fell. We force ourselves to feel the dread of children confused by what they see. We listen to a silent cry." Obama credited the United States and Japan for forging "not only an alliance but a friendship" and called for the ultimate elimination of the existence of nuclear weapons. The United States maintains about 4,700 nuclear warheads, far less than the peak during the Cold War, when the United States had more than 31,000 nuclear warheads in its arsenal. "We must change our mindset about war itself and prevent conflict through diplomacy and strive to end conflicts after they've begun," he declared. "We must reimagine our connection to each other, as members of one human race. "The world was forever changed here but today the children of this city will go through their day in peace. What a precious thing that is. It is worth protecting and then extending to every child," Obama said, concluding his remarks. "That is the future we can choose. A future in which Hiroshima and Nagasaki are known not as the dawn of atomic warfare but as the start of our own moral awakening." Japanese Prime Minister Shinzo Abe spoke after Obama, and then the two leaders greeted several atomic bomb survivors who were in attendance. 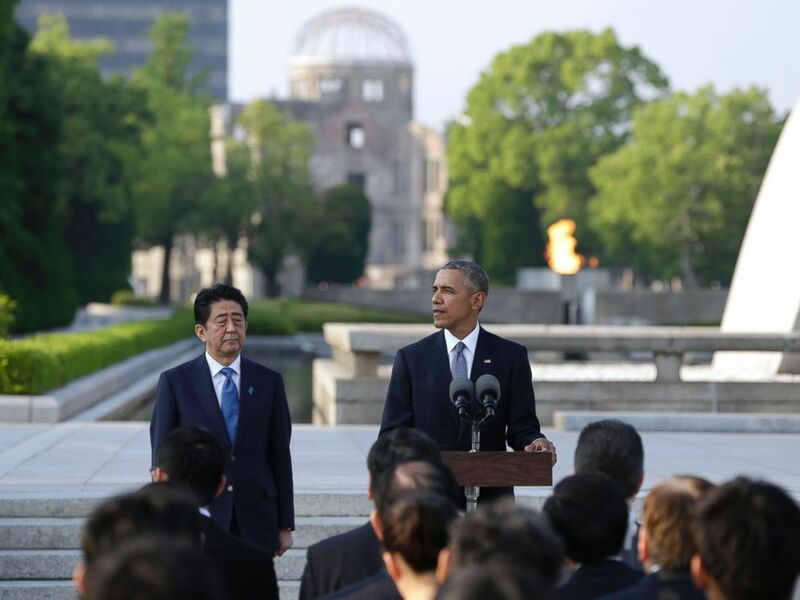 Obama and Abe then spent several minutes observing the Atomic Bomb Dome. 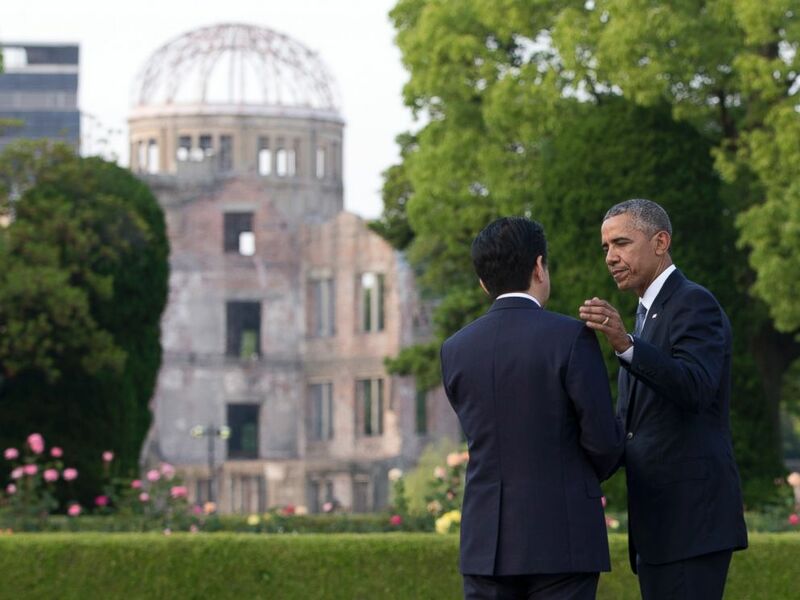 President Barack Obama and Japanese Prime Minister Shinzo Abe speak with the Atomic Bomb Dome seen at rear at the Hiroshima Peace Memorial Park in Hiroshima, western Japan, May 27, 2016. 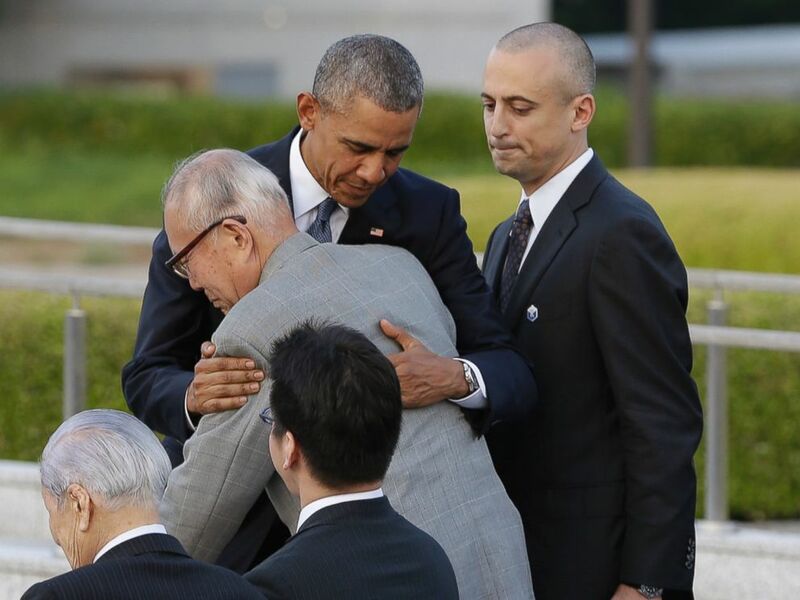 President Barack Obama hugs Shigeaki Mori, an atomic bomb survivor and a creator of the memorial for American WWII POWs killed in Hiroshima, during a ceremony at Hiroshima Peace Memorial Park in Hiroshima, western, Japan, May 27, 2016. Obama's visit to Hiroshima made him the first sitting U.S. president to visit since the atomic bombing of the city more than seven decades ago. Marine One landed in Hiroshima at 5 p.m. local time. The president was joined by U.S. ambassador to Japan Caroline Kennedy, the daughter of former U.S. president John F. Kennedy. 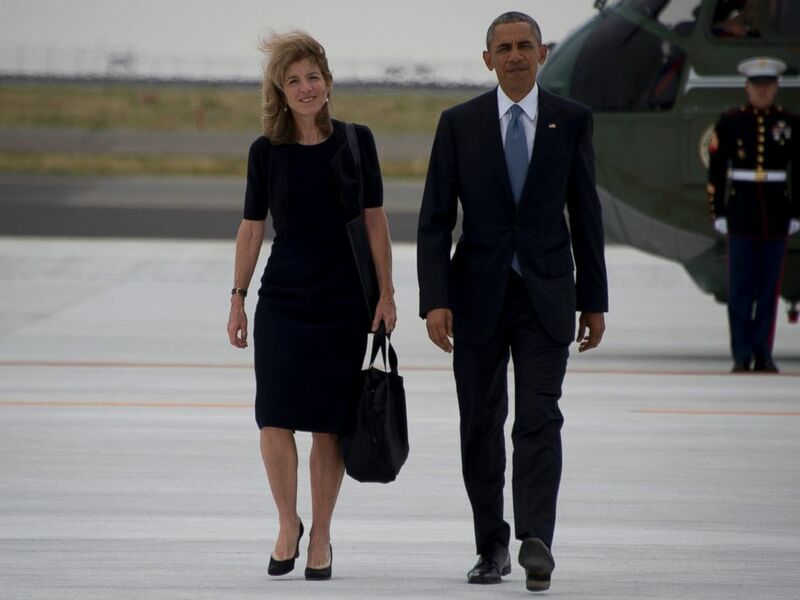 US Ambassador to Japan Caroline Kennedy and President Barack Obama walk following the end of the G7 Summit, at Chuba Centrair International Airport in Tokoname, near Nagoya, May 27, 2016. "We have known the agony of war. Let us now find the courage, together, to spread peace, and pursue a world without nuclear weapons," Obama wrote in a museum guest book. The event capped off his five-day trip to Vietnam and Japan. After a long flight, Obama returns to Washington late today.